Dungannon Swifts manager Kris Lindsay welcomes new signing Michael Carville to the club. Dungannon Swifts have signed striker Michael Carville, on loan from Danske Bank Premiership champions Crusaders, for the remainder of the season. Swifts manager, Kris Lindsay, has moved swiftly to secure the signing of Carville, ahead of the transfer window closing tomorrow (Thursday) night. 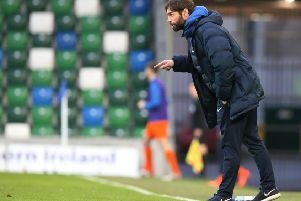 Carvill is an experienced Irish League player having spent seven years with Linfield, where he was part of three double-winning sides. He then signed for Crusaders in June 2015 where he went on to win two Premiership titles and a Country Antrim Shield. "I am delighted to get Michael on loan to the end of the season. When I became aware that a player of his quality and experience was potentially available, I jumped at the chance to sign him," stated Lindsay. The ex-Linfield man was delighted to have completed the move.